This is easily the hardest part for me to decide in this entire article. The Padres are FILLED with high-ceiling starting pitchers who are years away from MLB. What makes it even harder is the young pitchers already on the roster. The current farm system, along with prospects already on the club, make me want to do a 10-man starting rotation. Instead, I’ll do the “A starting rotation” followed by a “B starting rotation”, with more brief breakdowns of the “B” rotation players. It is also worth noting some who didn’t make the “A” cut will end up in the bullpen for the 2020 Friars. Breakdown: Padres signed 19-year-old Adrian Morejon last July with a signing bonus of $11 million, out of Cuba. Morejon was the #2 rated prospect in this past years’ international class, and the best pitcher on the list. Many evaluators see him as a future #1 or #2 starter. I have him being the ace of the staff. Morejon has a fastball that touches 96 mph, and a solid secondary pitch with his curveball. He also throws a knuckle-change sort of pitch that he is very comfortable using. His velocity and control will only get better as he gains more experience. He and Espinoza are easily the most exciting pitching prospects in the Padres’ system in terms of potential. The southpaw pitcher is ranked #100 on MLB pipeline, despite not having made his professional debut yet. That just shows the hype buzzing around him. He is also the Padres #5 rated prospect in the system. Expect Morejon to make his debut in 2019, but with a good chance it may end up being in 2020. 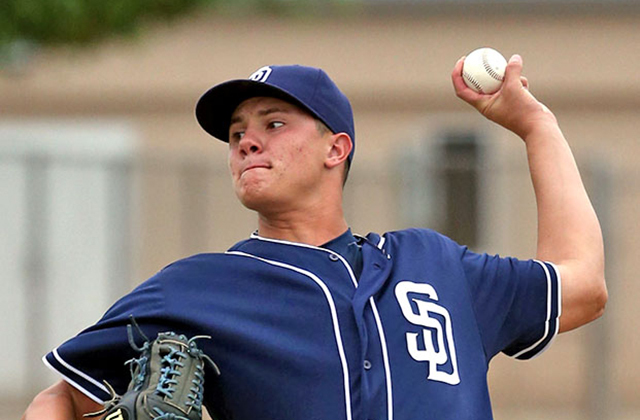 Adrian Morejon will likely be a front of the rotation guy for the Padres for many years if he develops the way the Padres hope. Breakdown: Anderson Espinoza was signed by the Boston Red Sox during the 2014-15 international signing period out of Venezuela. Espinoza has had just as much hype as anyone to come out of the international signing period. Many draw comparisons to Pedro Martinez and Felix Hernandez when speaking about this young right-hander. This is a very good thing, considering the careers those two pitchers have had. 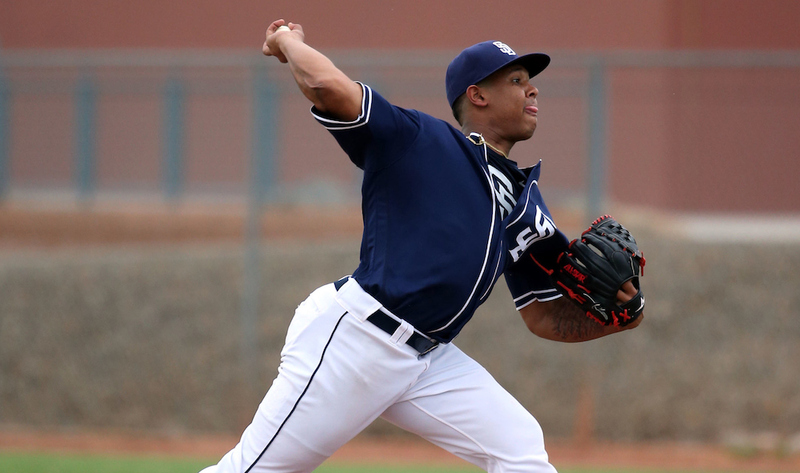 Espinoza is currently ranked as the Padres’ #2 prospect and MLB #23 prospect. 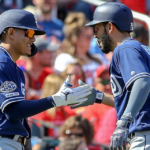 The Padres acquired Espinoza during the 2016 MLB All-Star break, from the Red Sox, for pitcher Drew Pomeranz, the day after he represented San Diego in the All-Star game. Essentially, the Padres flipped Yonder Alonso and Marc Rzepczynski (easily the hardest name I’ve ever had to spell) for Espinoza, Jose Torres, and Jabari Blash. Wow. Anyway, Espinoza has one of the best fastballs (that can hit 100 mph) by any prospect, that goes along with a plus change up and a potential plus curveball. That gives Espinoza three potential plus pitches, which is Ace status in MLB, considering he has solid control. Espinoza is currently on the disabled list and has yet to pitch this year. If he stays healthy, it’s almost a guarantee we see Espinoza on the 25-man roster in 2020. He can be expected to be a future ace that strikes out a lot of batters. The 1-2 punch of Morejon and Espinoza could be one of the best in baseball. Breakdown: Quantrill is expected to move through the minors at a very fast pace because he is one of the more polished pitchers in the farm system. 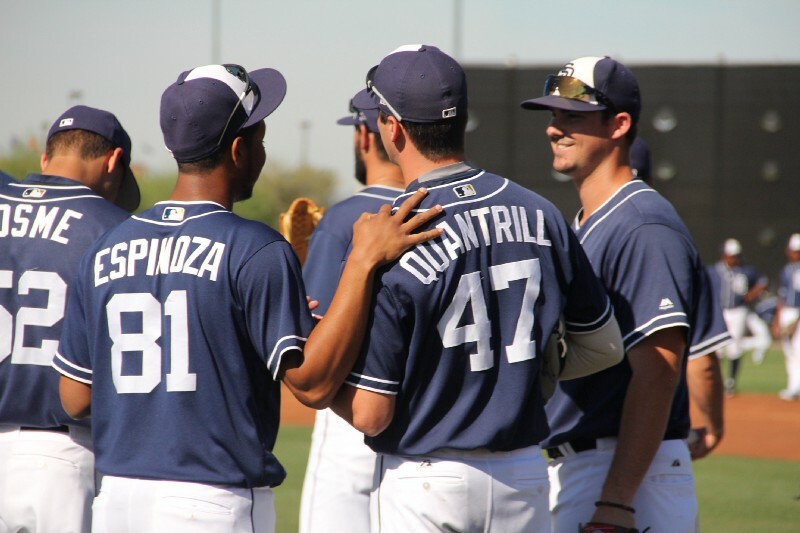 Quantrill was drafted by the Padres in this past year’s draft with their first overall selection (8th overall) in the first round. He is baseball’s #93 rated prospect and the Padres’ #4. Quantrill sat out his junior year at Stanford and missed all but three starts in his sophomore year because of Tommy John surgery, so the Padres are going to heavily monitor and limit his pitching over the next couple years, which is why 2019 is more of a realistic ETA. The Padres saw enough of Quantrill in college and bullpen sessions to draft him with their first selection, despite coming off Tommy John. Quantrill has one of the best changeups in the minors and at least an average MLB fastball and slider. He will make a solid middle of the rotation pitcher for many years, if he can get past elbow concerns. Quantrill is expected to have great control and has the ability to keep hitters off balance with his solid changeup. Breakdown: Nix was drafted by the Padres in the 3rd round in 2015 out of IMG academy. 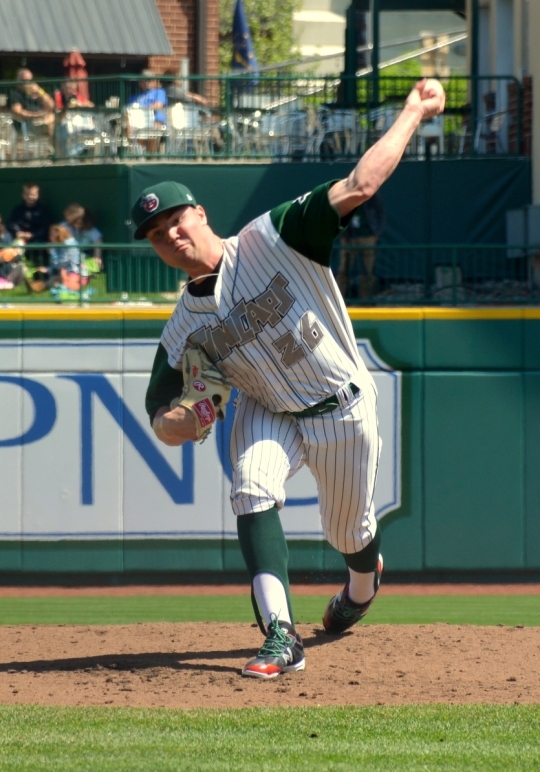 Jacob Nix started 25 games last year for Fort Wayne TinCaps, compiling a 3.93 ERA, striking out 90, and walking 20 over 105 innings pitched. It’s worth noting he only gave up five home runs last year in over 100 innings. Nix stands 6’4 and has solid control. He has two plus pitches with his curveball and fastball. He could be a very dominant middle of the rotation pitcher for the Padres in 2020 and will only be 23 years of age. Breakdown: I listed both Perdomo and Lauer for the 5th slot because whichever one isn’t in the starting rotation will be in the bullpen. I’ll start with Eric Lauer. He was drafted by the Padres in the 1st round this past year out of Kent State. Lauer led the entire NCAA with a 0.69 ERA his final year at Kent St. The left-hander has potential to have four average, or above-average, big league pitches and could be a very good 5th starter to any rotation in 2020. If Lauer does end up in the bullpen during the 2020 season, he would be used as a long reliever or make spot starts in case of injuries. He could be a very flexible option in the bullpen. Perdomo: Perdomo busted onto the scene towards the end of last season and emerged as the Padres’ best starter in the second half. Perdomo had no expectations for 2016, as a Rule-5 draft pick who never pitched above Single-A ball. Perdomo added a sinker into his mix and generated one of the best ground ball rates in all of baseball. The new and improved Luis Perdomo could become a very viable option for the Padres’ starting rotation presently, and for years to come, including the 2020 season. Perdomo is still very young at only 23 years old. If Perdomo ends up in the bullpen, he would be used in long relief as well as a spot starter for an injury to the rotation. Breakdown: Allen was acquired by the Padres in the Craig Kimbrel trade from Boston. He was drafted by the Red Sox in the 8th round in the 2015 draft. The 6’3 southpaw had a 3.33 ERA over 54 innings for Fort Wayne last season. His stock as a prospect had a rise last year because of his added velocity to his fastball. 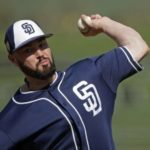 Allen is the Padres 19th-rated prospect presently. 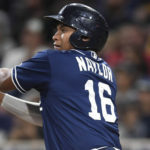 He is still maturing and developing, and could end up being one of the most promising young arms in the Padres’ system. It was tough to leave him out of the A rotation for 2020. Breakdown: Acquired by the Padres from the Mariners for Joaquin Benoit after the 2015 season. De Los Santos is the Padres 17th-rated prospect. 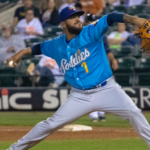 He was most impressive recently when he carried a perfect game into the 6th inning for the San Antonio Missions (Double-A). Unfortunately, the game had a long rain delay after the 6th inning, and De Los Santos didn’t return after the break. He only had 64 pitches with seven Ks after six perfect innings. He has good velocity on his fastball (93-95mph) and generates a lot of ground balls by keeping the ball low in the zone. He could be a dominant number four or five starter by 2020. Breakdown: Although Diaz is already pitching in the major leagues, he more than likely isn’t ready to be–except he is doing a pretty damn good job, proving that he deserves to be here. Diaz never pitched a full season of professional baseball, but the Padres still took Diaz with the 1st overall pick in the 2017 Rule-5 draft. Diaz has impressed many in the bullpen this year for the Padres, making established major league batters look foolish in the box. His fastball touches 97 mph with a lot of movement. Some of Diaz’s pitches just look down right filthy. 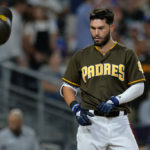 He’s been a joy to watch this season, and if he isn’t in the Padres 2020 starting rotation, you can almost guarantee that he will be in their bullpen. Breakdown: Paddack was injured late last season and went forward with Tommy John surgery in August. This injury unfortunately slowed down the un-hittable Paddock and will probably delay his arrival year till 2020. Paddack was acquired by the Padres from the Marlins for Fernando Rodney last season, prior to the All-Star break. Paddack compiled a 0.85 ERA over 42.1 innings pitched last year, while only surrendering 20 hits to opposing hitters. Paddack was in the middle of a three-game stretch where he went at least five innings without allowing a single hit when he was injured. He was incredible before his injury, but hopefully can make a successful comeback to his form. Paddack’s best pitch is his changeup, to go along with his effective fastball and breaking ball. He could be a potential number three or four starter in 2020 for the Padres. 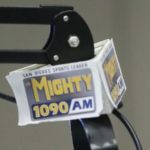 Breakdown: Thompson was another high-ceiling talent drafted by the Padres in 2016 along with Quantrill. Thompson is a 6′ 7″ giant pitcher with good velocity and a lot of promise on his secondary pitches. He could develop into a very effective starting pitcher in MLB. He still needs time though after recovering from Tommy John surgery in 2016. 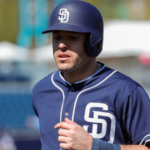 Previous Can Jamie Romak Be the Next Ryan Schimpf? I’m excited and will be patient.